The Select Uncoiler faciliatates the uncoiling of 5/16" to 1" Uponor PEX or up to 5/8" MLC tubing, which simplifies installation and reduces labor. The robust construction features an adjustable reel to allow for either horizontal or vertical position uncoiling. 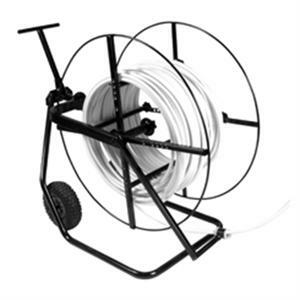 The durable wheels make for easy portability, and the uncoiler is equipped with a tube-feed eyelet. Due to large coil inside diameters, the Select Uncoiler cannot support 1,000" coils of 5/8" and larger MLC tubing.